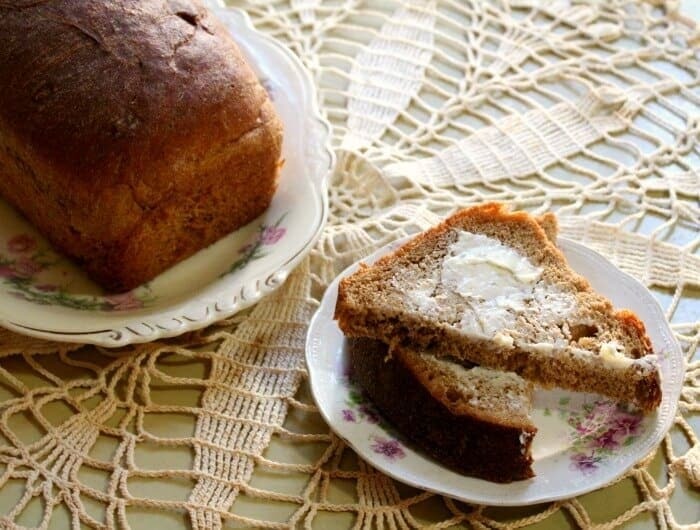 If you’re looking for a recipe for wheat bread like Grandma used to make you’ve found it. 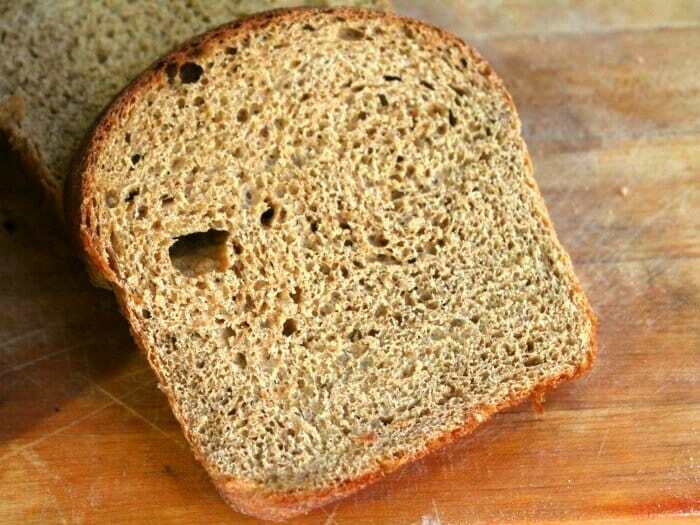 This 100 percent molasses whole wheat bread recipe has all the flavor and nutrition of whole wheat but the texture is more like a classic white sandwich bread. If it is kneaded properly the crumb is light and velvety and you can cut the slices almost paper thin — not that you’d want to. This is the bread I made most often when all of the kids were small. I have a wheat grinder and I’d make about six loaves every couple of days. My oldest son hated homemade bread. He told me that when he grew up he was only going to eat Wonder Bread and he’d never eat homemade bread, especially not homemade wheat bread again. Well, time has a funny way of changing your mind. He is now 29 and in the Air Force. In fact, he and my daughter-in-law work with the Thunderbirds so you may even see him sometime if you go to airshows. Anyway, he was stationed in Japan for several years and when he came home on leave do you know what he wanted? Yep. this recipe for wheat bread! 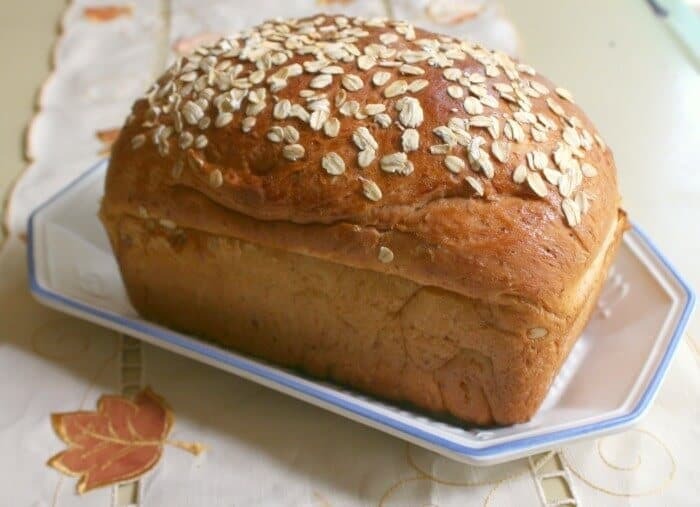 This recipe for wheat bread is hard to make by hand but it can be done — I did it for years. The main thing to remember is that you have to knead it enough. For wheat bread that can take 15 minutes so don’t get impatient. You’ll be able to skip arms day at the gym. When the dough is kneaded enough it will be smooth, slightly sticky, and will feel like your earlobe when you pinch it. This whole wheat bread recipe is by far my favorite. I have made it for over 40 years and, although I have used others, this is the one I always go back to when I want just a good bread for sandwiches. The crumb is soft and a little spongy like white bread. It’s just slightly sweet from the molasses, and it has that good nutty flavor from the whole wheat. 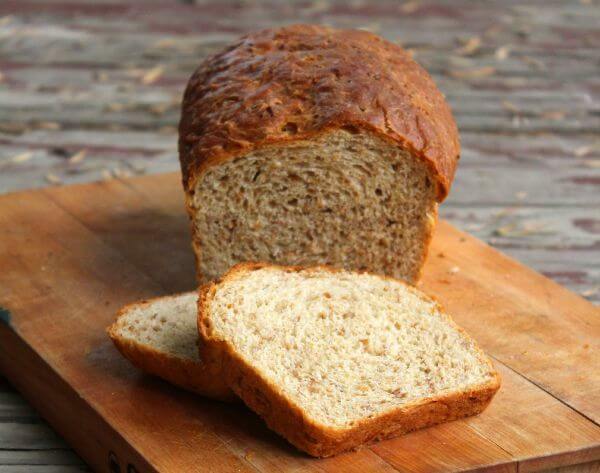 If your family usually doesn’t like whole wheat bread then give this one a try. 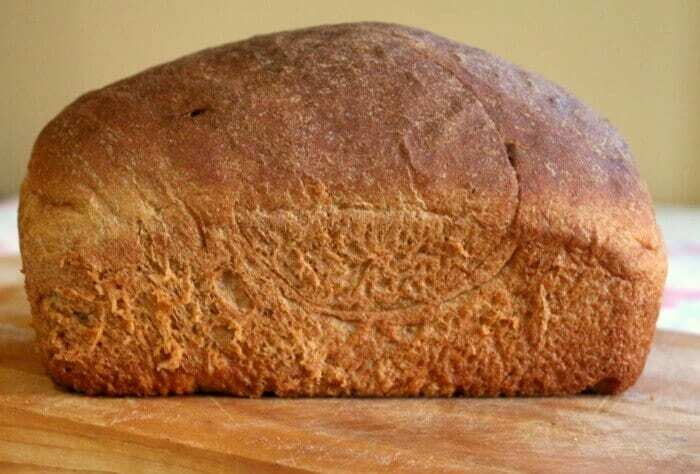 If you are not experienced with homemade bread then keep in mind that it takes a little practice to get it exactly right. Keep at it! And, please stop by the Restless Chipotle Facebook page and upload a picture of what you’ve created! 100% whole wheat and molasses bread with old fashioned flavor. The crumb is velvety, soft, and moist - this is a good bread for people who prefer white sandwich bread because it has a similar texture. Mix the molasses, yeast and water. Let stand for 5 minutes, or until it begins to foam. Melt the butter and add it to the milk. Add 2 cups of flour to the yeast mixture and mix until well blended. Let stand for abou 30 minutes (optional, but the texture of the finished bread will be better). Add the milk and butter mixture, salt, the gluten, and one cup of flour. With the mixer on medium (or as manufacturer recommends) begin to knead the dough, adding a flour a half cup at a time until the dough forms a ball that is smooth, elastic, and only slightly sticky. You may need a little more or less flour than specified. Knead on medium until smooth and elastic - for about 8 minutes total. Add enough flour to make a sticky, cohesive dough and turn out onto a floured surface. Knead, adding flour a little at a time until the dough is smooth and slightly sticky. Knead for about 15 minutes total. Lightly oil the ball of dough. Place it in an oiled bowl and cover with a clean towel. Put in a warm spot or a warming oven until it has nearly doubled, about 1 hour in the summer or 2 hours in the winter. The dough has risen enough when you poke it with your finger and the dent remains. Punch the dough down gently to deflate it. Knead a few times by hand and the separate into two balls. Form each ball into a smooth log and place in a greased bread pans. I used a glass 9x5 inch pan for these. Let rise until the tops of the loaves are well rounded and above the edge of the pans, about 45 minutes. Bake at 375F for 30 minutes or until loaves sound hollow when tapped. Brush tops with butter immediately after you take them from the oven. Turn bread pans on their sides and cover with a towel. Repeat with the other side for 5 minutes. Carefully remove bread from pans and allow to finish cooling under a towel. When do you add the wheat gluten? Hi! Can you sub honey for the molasses? I’ve made a couple of your other breads with great success and can’t wait to try this one. Thank you!!! Im sure you can. You just can’t mix the two. Can you use regular whole wheat rather than white whole wheat? yes – the texture will be a little heavier so you might want to use a little extra gluten. I made this bread today and had to send in a comment (which I normally never do). This is BY FAR, the BEST 100% Whole Wheat Bread I have ever made. I am a novice bread maker, followed directions exactly, and it came out perfect!!!. Taste, absolutely amazing. My husband was a bread man with Wonderbread for 38 years and loves it when I have your bread waiting for him on the counter when he comes home. I have made your Sweet Amish Bread several times, and your Honey Buttermilk Bread, and they are both fantastic as well!!. Awww thanks for letting me know Lori! You can right click and copy the page to a word file if you like. It’s per loaf. Bread can be sliced so many different sizes that I just usually give the info per loaf and you can figure it out from there depending on how many slices you get. I’m laughing about your son not liking wheat bread, because when I was a kid we would beg our mom to buy ‘”boughten bread.” But oh no, mom would make homemade bread for us (by hand!) Now I can’t imagine how I ever liked Wonder Bread! This looks like a great recipe. Thanks for the shout-out for my 100% Whole Wheat Bread with Olive Oil! Isn’t it funny how tastes change? 40 years…..I love recipes that stand the test of time! I”ll have to give yours a try. Since I am eating lower but healthier carbs, whole wheat is definitely on my list! Looks great Mary!